Last night saw the 46th annual American Music Awards (AMAs) that took place at the Microsoft Theater in Los Angeles, California and was hosted by the fabulous Tracee Ellis Ross. Now we all want to know who won what award, but let’s be honest, we really want to see what the masses of celebrity attendees were wearing to the sparkly event. From delightfully over the top outfits to those more simple and chic, here’s our top four favorite outfits from the night. All eyes are on Cardi B right now, whether it’s for flying through the charts with her own music and her collab’s or if its due to that outrageous scuffle she had recently with Nicki Minaj at NYFW. 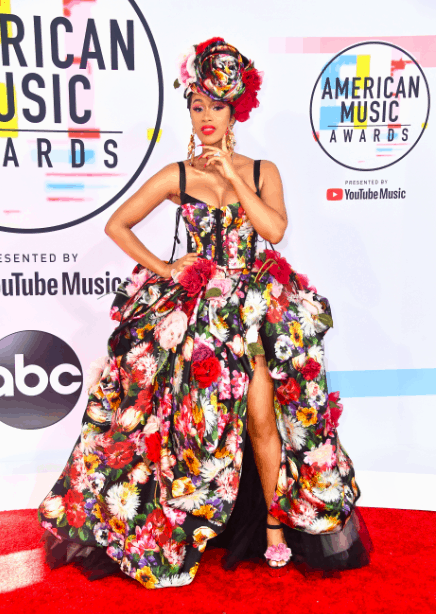 Cardi is having designers desperate to dress her for all the A-List events and we think she looks amazing in this bright, floral Dolce & Gabbana dress with matching headdress. Cardi went on to win three awards, Favorite Rap/Hip-Hop artist, Favorite Rap/Hip-Hop Song and Favorite Soul/R&B Song with her collab on the Bruno Mars song Finesse. Taylor Swift set the bar high this award ceremony by breaking an all-time American Music Awards record and swooping a whopping four awards. The songstress won Tour of the year, Artist of the year, Favorite Pop Artist and Favorite pop album! Taylor opened the AMAs with a performance of I Did Something Bad – and has in total won 23 AMAs! We think the pop artist rocked this fierce silver Balmain bodycon mini dress with matching thigh-high boots. Pretty in Pink Vanessa Hudgens looked stunning in this beautiful blush silk gown. Even though she was not nominated for any awards, she arrived at the red carpet ready for her duties as a presenter during the night. Vanessa made this dress look like it was made for her and we love it! ‘Hostess with the Mostess’ Tracee Ellis Ross wore an array of gorgeous outfits ranging from ultra-chic pants suits to a Shaina Twain inspired leopard print all-in-one as well as some grand dresses while hosting the ceremony. We adore this black and peach Pyer Moss SS19 RTW suit she wore on the red carpet.